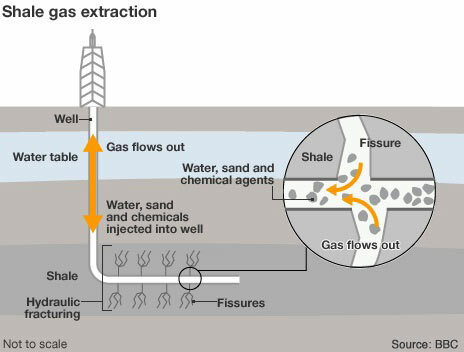 Hydraulic fracturing (fracking) is a process by which natural gas can be extracted from shale by injecting large quantities of pressurized chemicals into the earth. The pressurized chemicals shatter and corrode the rock, releasing a slurry of petrochemicals and rock fragments, that can be extracted and refined into usable fuel. Unfortunately, fracking is a process that is both very profitable for industry and very dangerous to every living thing in its vicinity. In the absence of strong regulations on the use of fracking, industry has rapidly expanded their use of the process and there are now tens of thousands of active wells in the USA today. As a matter of mechanics, fracking shatters rocks deep in the earth containing petrochemicals, causing earthquakes and releasing methane that filters up through the soil—these earthquakes can damage structures while the methane infiltrating the soil poisons living creatures and makes tap-water explosive. In addition to the mechanical problems with fracking, the chemical soup injected into the earth during the process contains extremely dangerous chemicals that have serious health consequences in humans. While a loophole in the law has shielded fracking companies from being forced to disclose the composition of fracking fluid, independent analysis of fracking fluid has revealed that it contains a long list of solvents, viscosity regulators, acids, preservatives, biocides and other chemicals. 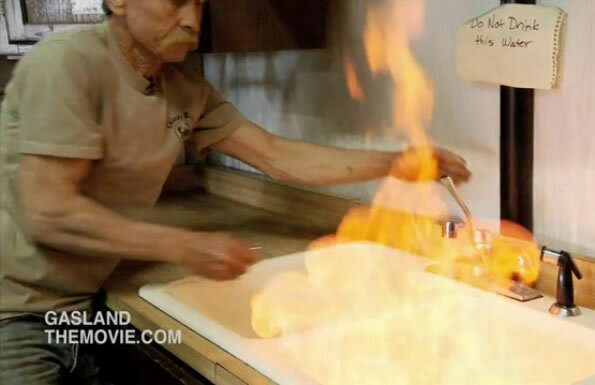 Some of the chemicals proven to be in many formulations of fracking fluid are extremely dangerous chemicals, including benzene (an explosive, toxic, carcinogen), formaldehyde, methanol, volatile organic compounds (neurotoxic), hydrogen fluoride (a corrosive poison that causes brittle bones, burns, seizures, and possible death upon exposure) and sulfuric acid. People living in areas surrounding fracking wells have exhibited a variety of health problems, including cancers, respiratory problems, endocrine disorders, nervous system disorders, and gastrointestinal disorders. Bacteria are able to grow in some extremely inhospitable environments, including everywhere from super-heated sulfurous vents at the bottom of the sea to the frigid arctic tundra—fracking bore-holes are no exception to this, and several dozen species of bacteria have actually thrived deep underground in the intense heat and pressure of shale gas deposits. Bacterial colonies can clog and obstruct fracking wells, making it harder to extract the natural gas after fracturing. In order to prevent these blockages, fracking companies have included large quantities of biocide pesticides in their fracking fluid. Without these biocides to retard the growth of bacteria into the pipes used to extract gas, fracking operations would suffer from decreased efficiency and a higher risk of pipe failure. While we know that fracking operations require the use of biocides, we simply don’t have a complete list of the biocides currently in use by the industry. That said, over 28 biocides (ex. chlorine dioxide, tetrakis phosphonium sulphate, glutaraldehyde, etc.) have been approved for fracking applications by the EPA. 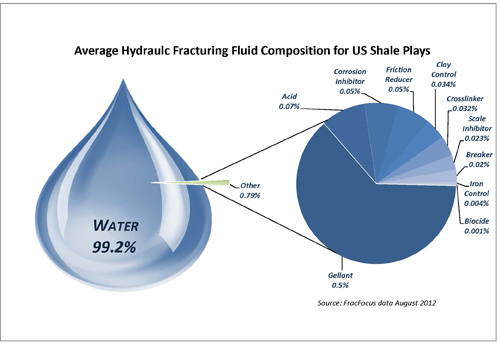 Many will argue that biocides in fracking fluid are not a significant because they compose only a miniscule percentage of the total volume of fracking fluid and because fracking fluid is injected deep under the ground—unfortunately, neither are valid reasons to be complacent about this issue. While biocides represent only a fraction of a percent of fracking fluid volume (we don’t have an exact percentage), the sheer quantity of fracking fluid used every year makes this small percentage significant. Every year, tens of billions of gallons of fracking fluid are pumped into the ground, thus even a fraction of a percent of this volume of liquid equals thousands, if not millions, of gallons of biocides. The millions of gallons of biocides being injected deep underground are unlikely to stay there forever. As we have seen with other fracking chemical ingredients, there is upward seepage which draws them from deep in expended wells into the surface soil and water table. This seepage causes contamination in the soil, water and even low-altitude air, depending upon the chemical in question (ex. methane contaminates the air, soil and water, while radioactive waste-water only contaminates the soil and water). Flooding our environment with a spectrum of biocides will inevitably lead to widespread ripple effects in our ecosystem, if not a complete upheaval (we see this same effect when we overuse antibiotics). Bacteria are a vital portion of most ecosystems and fulfill roles that support all higher organisms. Among other things, bacteria clean up after dead organic matter, convert nitrogen into forms usable by plants, and assist in the digestive process of many animals—without bacteria, none of these things would be possible and plants and animals alike would need to adapt or start to die out. What happens when large quantities of biocides start concentrating in the soil and killing the vital bacteria which assist the nitrogen cycle? Or when these biocides get into our water supply and start killing the bacteria which support the base of many ecosystems? Or even when humans start ingesting biocides and killing their gut flora? In short, all of these scenarios will result in useful bacteria dying off in large numbers and leaving necessary roles unfilled. Fracking companies like to portray the process as safe, efficient and a clean source of domestic energy—this is rather convenient for them, because they stand to make billions of dollars of fracking in the USA alone. Unfortunately, these claims are simply not backed up by reality. The preponderance of the evidence shows us that fracking is immensely destructive to the environment and the cause of a host of rather spectacular problems; of these problems, the most noticeable include earthquakes, explosive water, cancer clusters, multi-system health complications and crop die-offs. While it is less visual than a tap turning into a flamethrower, the danger of widespread seepage of biocides into our water and soil is very real and very threatening. If we aren’t careful, we may allow the contamination of huge swathes of our country with chemicals that disrupt the bacteria in our environment and cause consequences that we can only begin to predict. I liked this only to acknowledge another excellent piece of work. Sending to facebook and twitter for the same reason. Well done. I might add another danger of the hydraulic fracturing process, is the by product toxic waste fluids that in some states ( parts of NY for example), are sprayed on the roads in winter in lieu of salt. Just recently it has been in the news that an unsafe and abandoned salt mine on Seneca Lake in NYS is being considered for a dumping ground for thousands of gallons of fracking waste, putting in jeopardy a great deal of fresh water.